How much grooming does a Somali cat need? What should you know about playing with a Somali cat or leaving her at home? Learn more about Somali cats here. If wild looks and a curious nature are the keys to your heart then prepare to be won over by the stunning Somali cat! Don’t Somali cats look a lot like little foxes? Photography ©Louno_M | Getty Images. 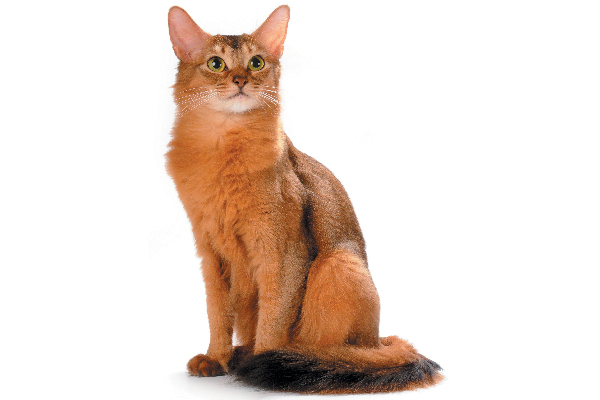 The bushy tail, lion-esque ruff around her neck and furry breeches give the Somali cat the wild look of a fox, but the breed is actually as simple as this: a long-haired version of the Abyssinian. That’s right: The Somali is the result of a recessive gene found in the Abyssinian, creating a fluffier version of the highly adored Aby! The ticked (or agouti) bands, alternating from light to dark, give the Somali cat an ethereal, glowing appearance that is hard to tear your eyes away from. Seen in four recognized colors (blue, ruddy, fawn and red), the ticked fur on the back and tail correspond with the lighter shade seen on the Somali’s underside to give her that lit-from-within glow. It might look like the Somali cat has a high-maintenance grooming routine, but she’s actually pretty easy-breezy when it comes to keeping that fur in tip-top shape. Weekly brushing makes her shine, while regular nail trims keep her toes, which feature tufts of fur in between, purrfectly manicured. Aside from featuring cute clumps of fur between each toe, those paws also have a unique ability: They can hold objects and food in them (like a monkey), open cabinets and cupboards with ease, and even turn on the faucet for a bit of water play! The Somali cat is a breed that seemingly never sleeps — a character trait that makes her endlessly entertaining. 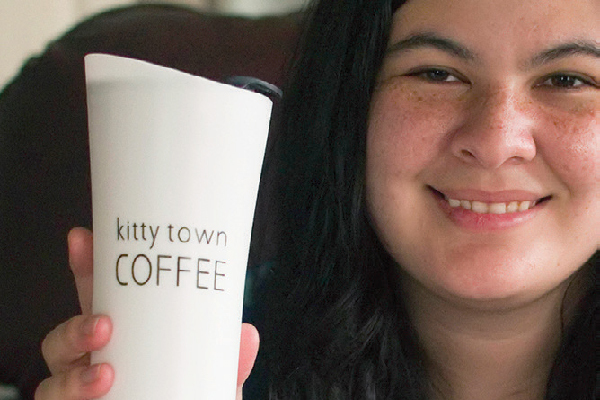 She notices everything and feels compelled to be in the thick of things — meaning she’s forever underfoot or overhead. Cooking in the kitchen? She’ll perch atop the refrigerator to supervise your meal prep! Getting ready to take a shower? She’ll position herself next to the sink, turn on the faucet and create a puddle to splash in! Working at the computer? You’ll find her sitting on your desk, ready to swipe at your fingers as they type away at the keyboard! Obviously, the Somali cat adores her humans — and that includes humans of all ages. She’s a huge fan of children, as they tend to match her activity, energy and curiosity levels, but she also thrives with dogs and other cats — especially Abyssinians or fellow Somalis who easily keep pace with her antics! You can’t fault a feline for being active, but the Somali cat takes active to a whole other level. This is a breed that would play 24/7, if able. Aside from being beautiful, the Somali is incredibly brainy, so puzzle games and toys never fail to please. Though satisfied with playing with items readily found around the house, such as crumpled paper, boxes and bags, and bottle caps, the Somali does thrive on lasers and cat wands. And if you throw a cat tree or two in the mix … better still! The Somali cat is most at home up high. She lives for heights that allow her to see everything so she doesn’t miss a thing. A few ceiling-scraping cat trees will thrill her, but if you don’t have the space, she’ll find a sky-high perch that pleases her. Trust us. You can leave a Somali cat home alone, but it would be at your own risk. You see, the Somali requires quite a bit of attention; and, if not human attention, she needs a furry companion. Without someone (other animal, child or adult) to interact with throughout the day, prepare to return to a house that has been turned upside down in search of fun! The Somali cat loves retrieving objects canine style, so human beware — if you teach her how to fetch, be prepared for the game to go on and on and on. Think Energizer Bunny! 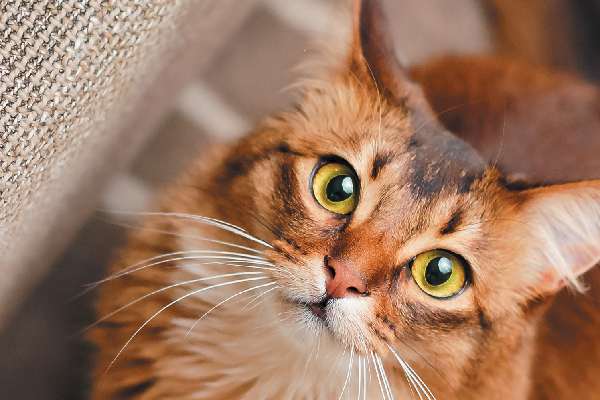 Tell us: Do you have a Somali cat? What do you love about Somali cats? Thumbnail: Photography ©grase | Getty Images. We have a Somali and she is older now. She used to fetch her toy and chirp. My husband could get her to chase ribbons in circles carousel style. She would sneek up on me and meow loudly or run a single claw down my back. In short a little clown. She is still extremely affectionate and sweet. I never have to worry about her scratching anyone. A dream to groom too. I can’t say enough about her. She is just awesome. I didn’t know a lot about Somali cats until I read this article. I have 5 Abyssinian cats and since these two breeds share a recessive gene I wasn’t surprised that everything you said about the Somali exactly describes the Abyssinian. They are very energetic, athletic and entertaining. If you want a couch-potato-lap kitty this is not the breed for you! But if a buddy that will follow you, want to know what you are doing, play fetch and even learn to do a high-five than these very intelligent kitties are for you!